The excitement after Android 4.4 KitKat's release barely died down when Google announced its most ambitious release ever: Android L. Packed with brand-new features and a massive UI overhaul, this is Android at its very best. Out with the old and in with the new. Google will be replacing its old Dalvik application runtime with the new Android Runtime or ART. ART, which uses an ahead-of-time compiler that compiles the bytecode to native code once whenever an application is installed and thus cutting off the need for further recompilation. This means that applications load and work generally faster compared to Dalvik. An improved battery performance is one of the most requested features by users and Android L brings exactly that. This release not only brings an improved battery life tracker, but also promises a massive upgrade in battery life. The bundle of improvements collectively titled as Project Volta makes sure that you won't have to keep clamoring for a charging spot every time you head out. Another good thing that comes with Project Volta is the Battery Saver option. Once turned on, it reduces your smartphone's performance to give you an extended battery life. The most noticeable change in Android L is the introduction of Material Design. 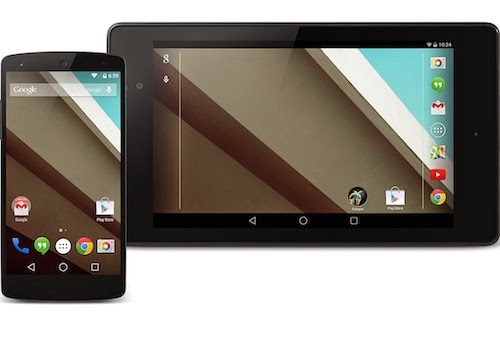 This change is a radical departure from the old design ideology of Android 4+ series. What you will see is more of a card-like layout with flat design and a very basic color palette. While the Holo design focused on black, Material Design is more brighter, whiter, and colorful. Android Police has done a great in-depth study of the new design and it is worth taking a quick read if you are an Android fan. Apart from being a massive visual overhaul, Material Design also affects the way elements interact with each other in the OS. Animations are not subtle but "originate" from a particular point helping you understand where elements come from and where they go. Also, the plain, minimalistic, and flat look helps Android catch up with iOS easily. Lock-screen notifications have been given a huge revamp in this release. All of your notifications from your favorite apps can be accessed from the lock screen itself. This makes it easier for you to take a quick glance at what's new without having to unlock your phone. Oh and yes, for those using KitKat, get ready to say goodbye to the good ol' widgets that use to adorn your lockscreen. If you are someone who cherishes spending time alone, this is a feature you would love to get your hands on. Do Not Disturb Mode holds off all notifications and gives you back your privacy until you instruct your smartphone to do otherwise. This is a great feature for catching a break from all the notification noise that shows up on our phones every second. A great addition to the list of features is Adaptive Brightness. This feature, by replacing Auto Brightness in previous versions of Android, makes it easier for you to read things on your phone no matter what lighting condition you are in. Of course, it is not perfect, but it's a major improvement from the previous Auto Brightness feature which wasn't delivering as good as it promised to deliver. Bluetooth 4.1 comes with a few improvements over its earlier version that is Bluetooth 4.0. The L release will embrace 4.1 thus helping Android keep up with the rest of the industry. Bluetooth 4.1 improves transfer operations and enhances connectivity between devices without the need for a new hardware. If you've owned a digital-to-analog converter or DAC for a while and are dying to connect it to your Android device, L release has got you covered. With support for USB audio being added in this release, music producers and audiophiles will have one more reason to get their hands on a brand-new Android device.